Randy Lowry discusses how some have been resistant to mediation education, but how it has been successful in changing legal processes and preventing litigation. This is a preview of the DVD "Strategic Negotiation: Integrating Negotiation Approaches to Achieve Best Results" with Randy Lowry and Peter Robinson. Full information on the DVD is available here. Randy Lowry talks about how the institutionalization of mediation as a positive within court and justice systems. Randy Lowry discusses how negotiation training would be useful for those going through medical school. Also talks about project he's working on now assessing three hospitals' way of dealing with things like conflict. Randy Lowry talks about why he got into and stayed in mediation: enjoys teaching, relates to a sense of faith, enjoys being a "minister of reconciliation." Randy Lowry discusses the development of mediation in US culture -from colonial times to the present day. Randy Lowry discusses why law school academics might be resistant to teaching the negotiation skill set. It's not something they themselves will practice and their main responsibility is to teach how to be and to think like a lawyer. Randy Lowry describes the introduction of mediation/negotiation study into the academic world. Randy Lowry speaks of the developments in the mediation field he foresees: more educational programs in schools, more institutions, more agencies practicing mediation, growth of programs, program expansion at Pepperdine, contribution to medical field. Randy Lowry discusses the development of Pepperdine's mediation program and incorporation into the law school. Foundation for law school is to translate theory into practice. 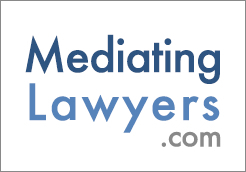 Welcome to the newest on-line resources for lawyers – The Mediate.com Legal Section. This section has been developed with resources of particular interest to practicing lawyers. It is full of information that will help you serve clients more effectively and practice more successfully. Complete hour-long interview of Randy Lowry by Robert Benjamin.